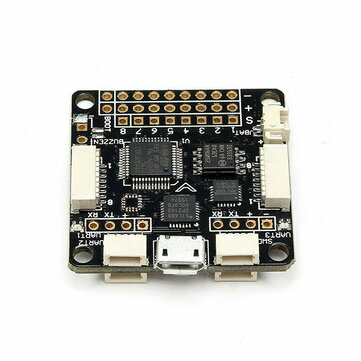 *35x35mm board, 30mm mounting holes. * 8 x 3 pin though-holes for pin headers for ESC / Servo connections. * 2 x 4 pin though-holes for the 2x serial ports . * 2 x 2 pin though-holes for battery voltage and buzzer. Many bugs fixed from Baseflight. Supports more flight controllers, including CC3D, CJMCU and Sparky. Supports OneShot ESC and more than 8 RC channels. Many more features such as RGB LED strip support, Autotune, In-flight PID tuning with your radio etc. The F3 builds on tried and tested software, processor and sensor technology to make your aircraft fly like it's on rails. The F3 runs Cleanflight which can be configured to suit your needs using a cross-platform GUI (Windows/OSX/Linux). The F3 has a standard 35x35mm form-factor with 30mm mounting holes and weighs just 6 grams. The F3 has an ARM Cortex-M4 72Mhz CPU with Math co-processor (FPU) for efficient flight calculations that gets more done in less time.